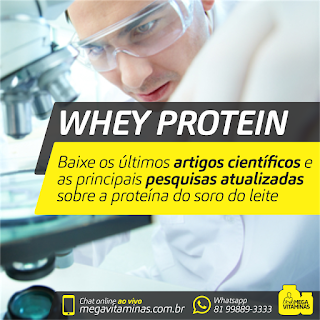 O que a ciência diz sobre Whey Protein? Quais as últimas evidências científicas e artigos relevantes sobre a proteína do soro do leite? Stobaugh, H. C. et al. Including whey protein and whey permeate in ready-to-use supplementary food improves recovery rates in children with moderate acute malnutrition: A randomized, double-blind clinical trial. American Journal Clinical. Nutrition. 103, 926–933 (2016). Tosukhowong, P. et al. Biochemical and clinical effects of Whey protein supplementation in Parkinson’s disease: A pilot study. Journal of the Neurological Sciences. 367, 162–170 (2016). Miller, P.E., Alexander, D.D., Perez, V. Effects of whey protein and resistance exercise on body composition: a meta-analysis of randomized controlled trials. J Am Coll Nutr. 2014 Apr;33(2):163-75. SANTANA, D. A. Efeitos da suplementação de whey protein durante o treinamento de força na massa magra: uma revisão sistemática. Revista Brasileira de Prescrição e Fisiologia do Exercício, São Paulo. v.8. n.43., 2014. Tsutsumi1, R. & Tsutsumi, and Y. M. Peptides and Proteins in Whey and Their Benefits for Human Health. Austin Journal of Nutrition and Food Sciences. 1, 1002 (2014). Volek, J. S. et al. Whey protein supplementation during resistance training augments lean body mass. Journal of the American College of Nutrition. 32, 122–35 (2013). NACLERIO, F., ALKHATIB, A., JIMENEZ, A. Effectiveness of Whey Protein Supplement in Resistance Trained Individuals. J Sports Med Doping, 2013. Kanda, A., et al. Post-exercise whey protein hydrolysate supplementation induces a greater increase in muscle protein synthesis than its constituent amino acid content. Br J Nutr. 2013 Sep 28;110(6):981-7. SCHOENFELD et al. The effect of protein timing on muscle strength and hypertrophy: a meta-analysis. Journal of the International Society of Sports Nutrition, 2013. Morato, PN., et al. Whey Protein Hydrolysate Increases Translocation of GLUT-4 to the Plasma Membrane Independent of Insulin in Wistar Rats. PLOS ONE, August 2013, Volume 8, Issue 8, e71134. Sousa, G.T.D., Lira, F.S., Rosa, J.C., de Oliveira, E.P., Oyama, L.M., Santos, R.V., Pimentel, G.D. Dietary whey protein lessens several risk factors for metabolic diseases: a review. Lipids in Health and Disease 2012, 11:67. Yang, Y., Churchward-Venne, T. A., Burd, N. A., Tarnopolsky, M. A. & Phillips, S. M. Greater stimulation of myofibrillar protein synthesis with ingestion of whey protein isolate v. micellar casein at rest and after resistance exercise in elderly men. British Journal of Nutrition. 108, 958–962 (2012). Akhavan, T., et al. Effect of premeal consumption of whey protein and its hydrolysate on food intake and postmeal glycemia and insulin responses in young adults. Am J Clin Nutr 2010; 91: 966–75. Morley, J.E., et al. Nutritional Recommendations for the Management of Sarcopenia. (J Am Med Dir Assoc 2010; 11: 391–396). Hays, N.P., Kim, H., Wells, A.M., Kajkenova, O., Evans, W.J. Effects of whey and fortified collagen hydrolysate protein supplements on nitrogen balance and body composition in older women. J Am Diet Assoc. 2009 Jun; 109(6):1082-7. PAL, S. and ELLIS, V. The Chronic Effects of Whey Proteins on Blood Pressure, Vascular Function, and Inflammatory Markers in Overweight Individuals. Obesity, 2009. Monograph. Whey Protein. Alternative Medicine Review Volume 13, Number 4 2008. Tipton, K.D. Stimulation of net muscle protein synthesis by whey protein ingestion before and after exercise. Am J Physiol Endocrinol Metab 292: E71–E76, 2007. Cribb, PJ., William, A.D., Stathis, C.G., Carey, M.F., Hayes, A. Effects of Whey Isolate, Creatine, and Resistance Training on Muscle Hypertrophy. Medicine & Science in Sports & Exercise, 2006. Phillips, S.M., Hartman, J.W., Wilkinson, S.B. Dietary Protein to Support Anabolism with Resistance Exercise in Young Men. Journal of the American College of Nutrition, Vol. 24, No. 2, 134S–139S (2005). Proteína - Qual é a melhor? Hoffman, J.R., Falvo, M.J. Protein – Which Is Best? Journal of Sports Science and Medicine (2004) 3, 118-130. Kent, K.D., Harper, W.J., Bomser¸ J.A. Effect of whey protein isolate on intracellular glutathione and oxidant-induced cell death in human prostate epithelial cells. Toxicology in Vitro 17 (2003) 27–33. Ibanoglu, E., Karatas, S. High pressure effect on foaming behaviour of whey protein isolate. Journal of Food Engineering 47 (2001) 31±36. Increased Dietary Protein Modifies Glucose and Insulin Homeostasis in Adult Women during Weight Loss. The Journal Of Nutrition, pag 405-410, 2002.